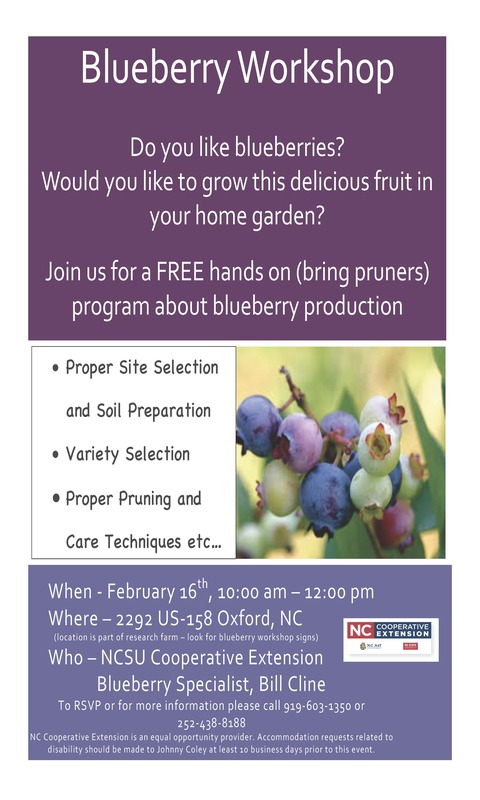 Join us on February 16, 2019, from 10 a.m.–noon to learn all about how to grow and care for blueberries. This workshop will include information about site selection, soil preparation, and choosing the right varieties in order to maximize your blueberry production. You will have the opportunity to visit a blueberry plot and get hands advice on how to prune and care for your blueberries. Bill Cline, N.C. Cooperative Extension Blueberry Specialist, will present the program and be available for any questions you may have regarding this wonderful fruit. So, bring your pruners and join us as we learn all about blueberries. The workshop will be conducted at 2292 US Highway 158, Oxford NC (watch for signs). For more information or to register please contact Johnny Coley at johnny_coley@ncsu.edu or call 919-603-1350 or contact Paul Mckenzie at paul_mckenzie@ncsu.edu or call 252-438-8188. You may also register online.